The Listening Post is a fortnightly snapshot into the wellbeing of our school community at Winters Flat Primary School (see our school newsletter Flat Chat for fortnightly updates). At our school, student wellbeing is seen as everyone’s responsibility. We believe in the old African proverb that it takes a village to raise a child. 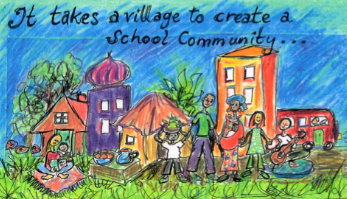 We believe that creating a village; a community of care is the best way to support children’s, families and teachers wellbeing and reslience. We do this by inviting familes to participate in their school community in whatever way they can, in a way that is meaningful to them. We have a strong sense of community at WFPS built around the sharing of skills, tasks, talents, and food (see The Kitchen Garden) and the philosophy of sustainabilty. We have an overaching framework of the School Wide Postive Behaviour Support program, and our mascots The Care Crows encourage us to bring out the best in our selves, each other and our enviroment with our school motto: Care for self, others and the environment. Also embedded in our school culture are the Berry Street Education Model and Respectful Relationships. We also have a strong Koori culture at WFPS, with local children attending the Meeting Place once a fortnight where they explore more traditonal forms of learning. With a good working relationship with the locally run Nalderun Aboriginal service and the Dja Dja Wurrung community, we have a strong commitment to working with our local Koori community to enrich our school culture and support all our students in building on their strengths and reslience. With the appointment of a new, multi-talented principal Suzanne Kinnersley, and a re-purposed school building soon to be open, we are re-visioning the way school can be a place that is meaningful to families and deeply embedded in the local community and shire. A key to forming a strong working community is to have good communication. Communicating well and clearly is high on our agenda at Winters Flat, both within the school walls and beyond. We want each member of our school community to feel seen, heard and valued for the unique contribution they bring to the greater good of the community.